Sneak-Peek Photos, Eye Candy Episode – FACE OFF! 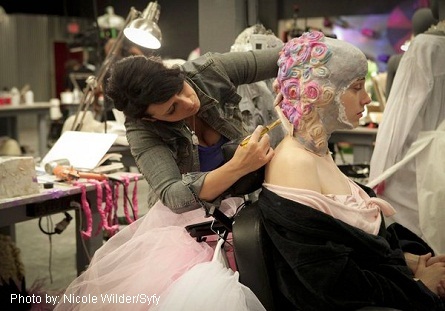 FACE OFF new episode airs Tuesday, February 5 on Syfy 9-10 pm ET. 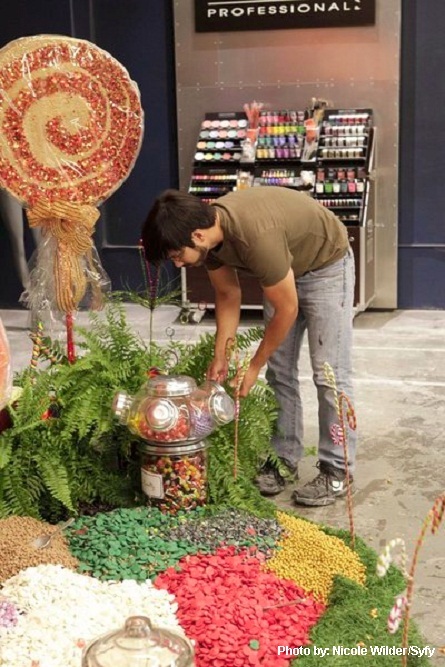 Contestants will be challenged to create “delicious candy creatures,” which is one more challenge closer to one artist’s chance to win the grand prizes of $100,000, a 2013 Fiat 500, and will also be given the opportunity to become a guest lecturer at the MAKE UP FOR EVER Academies in New York and Paris. Hosted by Mckenzie Westmore, this season features guest judges Bryan Singer, Gale Anne Hurd, John Landau, Michael Nankin and Johh Rhys-Davies to the regular panel of judges Ve Neil, Glenn Hetrick, and Neville Page. Joining the series as the official contestant mentor is world-renowned Hollywood makeup artist and McKenzie’s father Michael Westmore. Pictured: Kris, EYE CANDY episode. Pictured: (l-r) Eric Z., John Myatt, McKenzie Westmore.